When we think of chemistry, we envisage scientists in white lab coats that handle conical flasks and raw chemicals over Bunsen burners in their laboratory. Or we think of complicated formulae which we already failed to understand in school. forests and into the monasteries and castles in Europe! This is where centuries ago fire was used to transform materials: the rind of lianas into deadly poison, salpeter into gun powder, (huge amounts of ) children’s wee into (tiny amounts of) phosphor. Generations of creative alchemists in vain put their entire life’s energy into the production of gold and instead discovered porcelain and much more without which our world would not be imaginable today. 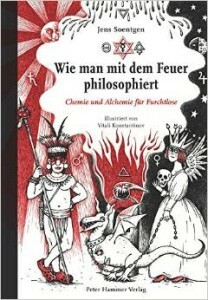 Jens Soentgen, natural scientist and philosopher, moves from one fire place to the next and enthusiastically narrates the most crazy and suspenseful stories of substances, alchemists and chemists. He doesn’t forget to include the often fatal mixture of chemistry and power. The second part of the book includes many new experiments with which the unafraid can spark their own passion for the metamorphosis of substances!